Thursday, May 2, is the National Day of Prayer, a day when Christians gather to pray for the president and all of our nation’s leaders. However, many Christians express more anger than prayer for President Obama. The same was true when President Bush was in office. Just as much vitriol was poured out against him from the left as is now being poured out against President Obama from the right. Yet it is my duty to pray for my president daily. 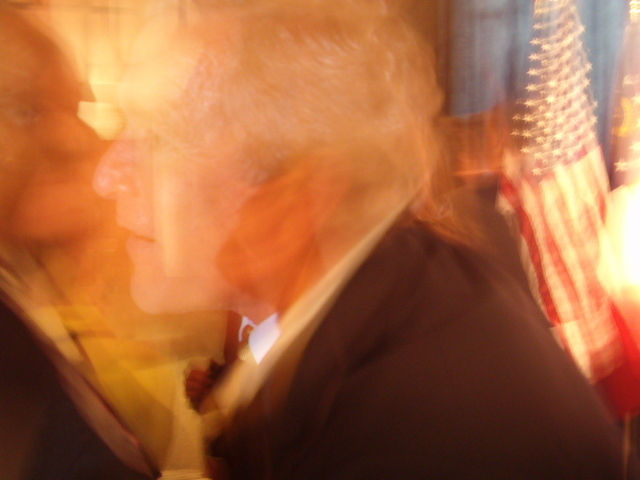 This fuzzy photo is a picture of President George W. Bush. On August 21, 2006, I led a public prayer for President George W. Bush at a campaign rally. After the president spoke, he went through the crowd shaking hands, and I grabbed my camera and took this picture in such a hurry that it came out so fuzzy. As Mr. Bush greeted the crowd and shook my hand, I said, “I pray for you every day.” He looked me in the eye, and exclaimed, “Thanks, it’s working!” A priest who disliked President Bush’s policies later told me, “It must not be working.” Because he disagreed with the politician, he dismissed the prayer. How short-sighted! Scripture commands us to pray for our leaders. The apostle Paul said, “I urge that petitions, prayers, intercessions and thanksgivings be made for everyone, for kings and for all those who are in authority…” (1 Timothy 2:1-2, HCSB). The Old Testament prophets modeled this kind of praying for us. Isaiah said that the Lord “wondered that there was no intercessor” (Isaiah 49:16), Jeremiah wept over the nation, and Ezekiel called for someone to “stand in the gap” (Ezekiel 22:30) on behalf of the nation. So I must pray for President Obama, just as I prayed for President Bush. After all, if first century Christians could pray for a Roman emperor who threw them to the lions, cannot we pray for an elected president with whom we may disagree? Notice that when Paul urged us to pray for political leaders, he also gave us a reason: “… so that we may lead a tranquil and quiet life in all godliness and dignity” (1 Timothy 2:2b). African-American pastor Tony Evans points out, “What many conservative Christians fail to realize … is that when our first black president, Barack Obama, is dishonored through caricatures, name-calling, or disrespectful talk by white Americans, it merely creates a greater chasm between the races.” (Tony Evans, Oneness Embraced, p. 52). Evans illustrates what the apostle Paul was talking about– angry words instead of words of prayer for President Obama create chaotic lives, not tranquil lives. One preacher pointed that that if we would pray for the president instead of complain about the president, maybe he would do better. So I am praying for President Obama. Will you join me this Thursday and every day?